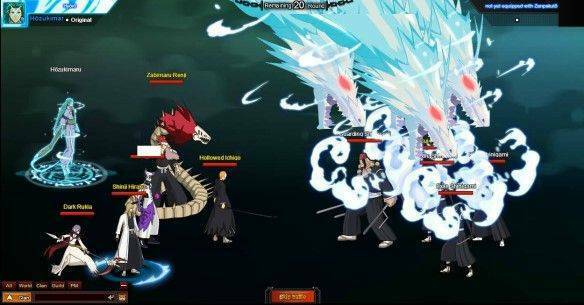 Bleach Online is an point-and-click party building MMORPG revolving around the exploits and events popularised in the Japanese manga comic/anime Bleach, in the game players will step into this world and meet many of the characters, both friends and foes, in an in-depth story driven MMO RPG. The player takes on the role of a wounded soldier from an unknown battle who has been asleep for one thousand years, woken up to seek out a hero named Ichigo (the main protagonist from the series) who will hopefully be able to give the player some answers as to who they are and where they came from. The game revolves around the player increasing their Battle Power, a numerical public value that shows how powerful a player and their party is in comparison to the AI challenges and other players in the game. Players must actively try to increase their Battle Power so that they can take on new enemies, advance the storyline and gain access to more game features. Primarily this is done by levelling up the players main character, available from six different premade characters both male and female who are split into three different classes: Ghost Sword, Spirit Blade and Kid?. By performing quests and advancing the storyline players will also come across new companions that they can add to their party, characters that they are also responsible for levelling up as well as keeping both them and their main character equipped with new weapons, armour and gear all of which will directly improve the players Battle Power. There are a number of different features available in the game is also improve a parties Battle Power, such as the Soul Map where players are able to improve their main character by advancing through the Soul Map and putting in points to increase certain attributes and defences as well is unlocking new skills. There are five different maps available, each unlocked once the previous map is filled. Players can also simply earn new rewards by logging into the game each day, accessing the Numa Class, which is the trivia-based feature that asks a multiple choice question based on Bleach and allows players to earn extra rewards. With a variety of PVE focused instances that further unlock the quest areas in the game or challenging features such as the Trial Tower, Soul Hunt where players hunt down wandering spirits of the Home System where players can Konso evil spirits each day to gain rewards from killing them. There is also a Girlfriend system where by interacting with your girlfriend each day players get skill scrolls based on her mood which ranges from angry, sad, happy and high. Players also are able to improve their VIP rating by paying to refresh their character, which will replenish their vitality and allows them to keep playing the game and performing actions and in turn having a higher VIP level grants more daily bonuses, access to features and makes gameplay easier.